Pets cannot talk and tell us what hurts or what is going on with them, so veterinarians have to be skilled in the art of diagnostics. A thorough physical examination goes a long way in determining what is happening with a pet that is not feeling well, but often leaves us with a list of different potential diagnoses. The veterinarian then has to choose what diagnostic tests need to be run, to narrow it down to a definitive diagnosis, and then choose a proper treatment plan. 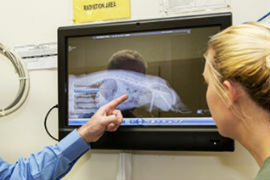 My Pet’s Vet has state of the art diagnostic equipment to help us better serve our clients and their pets. We have a digital x-ray system that provides rapid and detailed radiographs when needed. We also have the ability to consult digitally with board certified radiologists. We can do the same thing with electrocardiograms and board certified cardiologists. 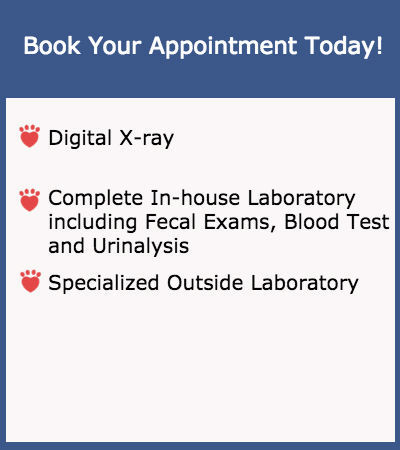 Our in house laboratory allows us to quickly perform a urinalysis, ear cytology, intestinal parasite examination, skin scraping analysis and aspiration cytology, as well as multiple specific disease test such as Heartworm, Giardia, Feline Leukemia, Feline Aids, Parvovirus Erlhichia, Anaplasmosis, and Lyme disease among others. We are most proud of our blood machines that can deliver results in as little as 12 minutes for complete blood counts, blood chemistry profiles, blood glucose levels, thyroid levels and cortisol levels. Our clients can get results and begin treatment rapidly on the same visit instead of having to go home and worry until coming back a day or two later for results. We strive to treat your pets better than our own doctors treat us, because “Pets Are Family Too”!